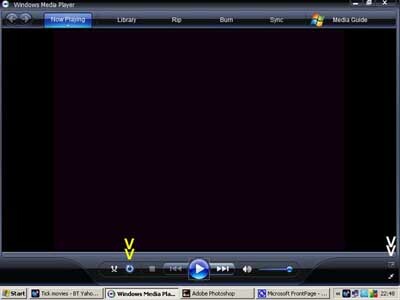 To repeat play a movie, click the repeat icon under the double yellow arrows.  To see it Full Screen, click the icon under the double white arrows. Very small frenetically wriggling entities. The cells are salivary gland tissue? Definite long, doubled up spiralling microbe - spirochaete? 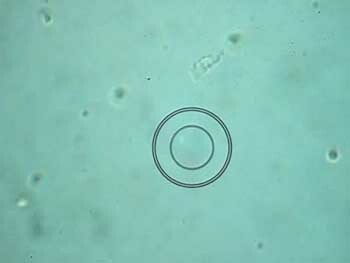 The bacteria are in a depth of saline and come in and out of focus in the microscope. This was one of four seen - at first I ignored them as something odd - they were partly doubled-up which may be a result of the non-physiological nature of the saline - missing electrolytes and incorrect pH (acidity / alkalinity)? Showing another hazard of blanket dragging on Dartmoor - cows! Similar to the previous movie but filmed on the move, backwards! Showing how desolate this area is. It is not necessarily very high, at typically 300 metres (1,000 feet), but it is very exposed and wind-swept - listen to the sound track, and this was a non-windy day! Showing the stubby nature of the bracken area beside the plantation compared to the high bracken in the shelter of Yarner Wood (movies 14-16 ). This habitat contiguous with Ringmoor Down (movie 19). 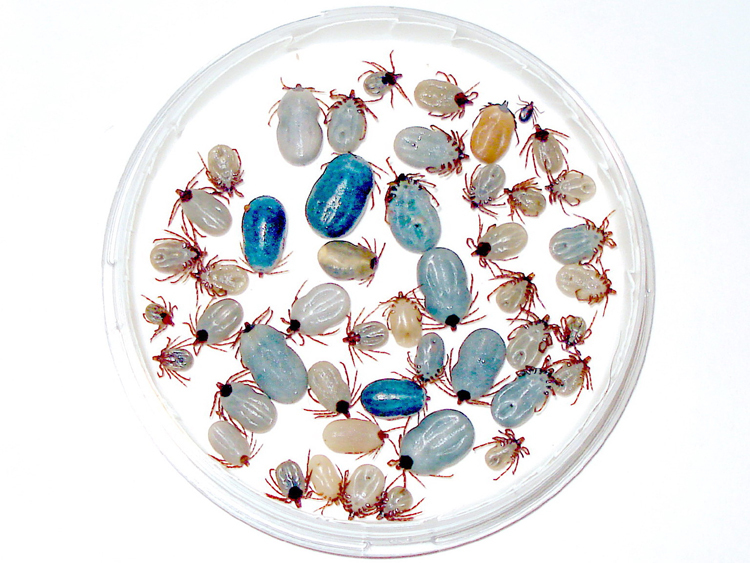 ** A 'still' photograph of the 47 ticks, cleaned-up, can be seen here and on the Photos page. 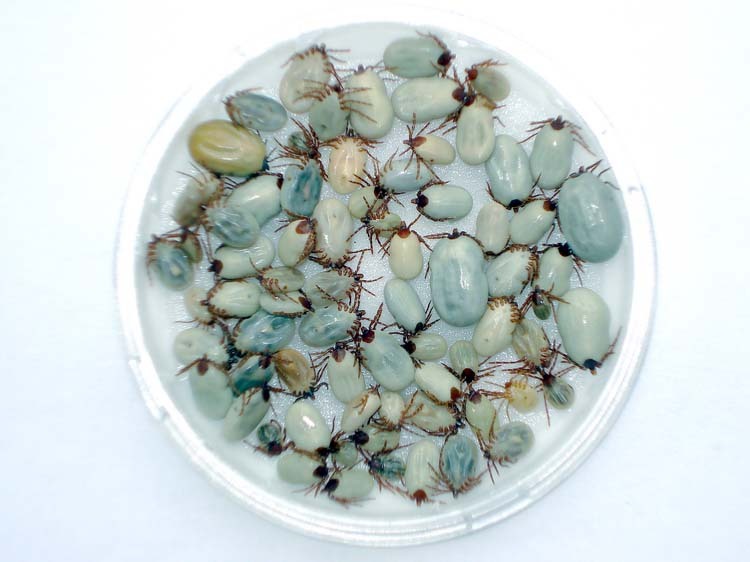 *** A 'still' photograph of the 72 ticks, cleaned-up, can be seen here and on the Photos page. These (47 & 72 ticks) are all hedgehog ticks, removed from two sheepdogs - that is correct! Low power Nomarski image of the decapitated nymph-showing manually extruded gut contents, at top-left. Magnification: x250 plus zoom on the camera. 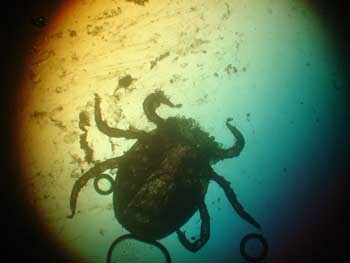 The tick body in this image is probably about 1.4 mm long. The on-screen image on a 800x600 display is 50 mm, therefore the magnification is about x35. 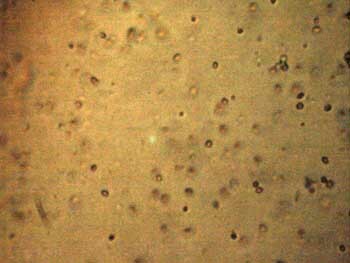 Still image of gut content entities under oil immersion (x1,000 + zoom). This can be seen more dramatically in the gut content movies above. The moving microbes are in the 1 to 5 micrometer size range. 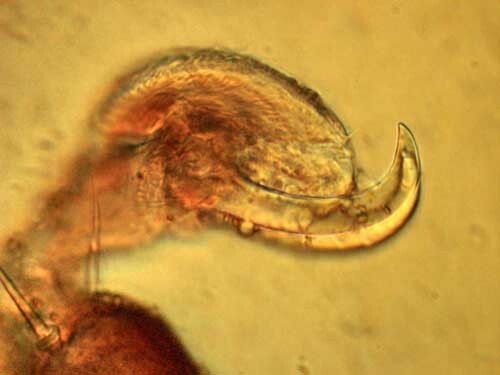 Nymph foot, showing the terminal claws - highly magnified.